On Tuesday, the Dow Jones Industrial Average (INDU) managed its eighth consecutive advancing session (though just barely), which is a fairly rare event. In fact, since 2000, there have only been eleven prior instances when the Dow advanced for at least seven consecutive days. Of those, it made it to an eighth day on only five occasions. If my historical data feed is correct, it has not managed nine consecutive advances even once since 2000. 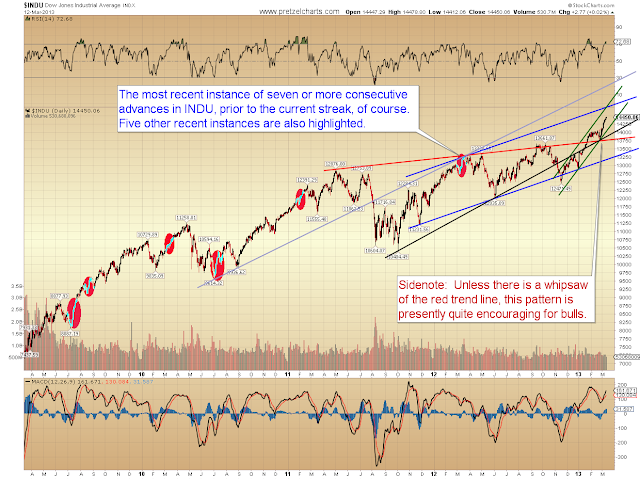 There is another interesting fact that goes with this: not one of these win streaks marked "the end," and a major top. Some of them were followed by steep corrections, but in every single instance, the corrections were bought and ultimately resulted in a new high. In a few instances, seven consecutive advances did occur in close price proximity to an intermediate top -- the most recent example being almost exactly a year ago. The INDU rallied seven straight days into mid-March of 2012, then sold off briefly before finally reaching a new high a month and a half later. 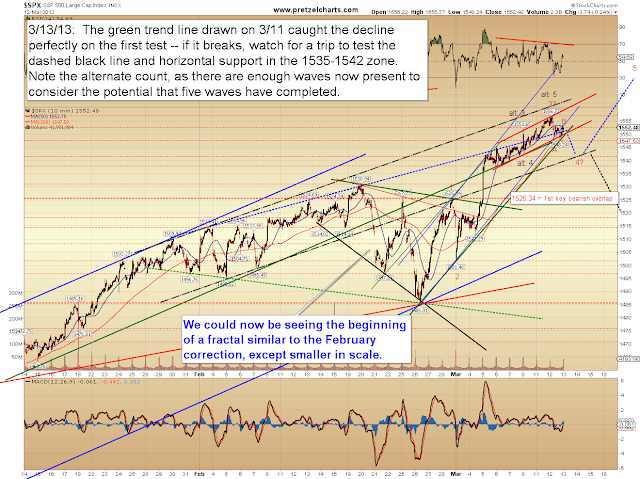 From there, it embarked on a steep 10% correction. However, on the chart below we can also see that some of these win streaks were followed by shallow corrections which were extremely short-lived. The bottom line is that a near-term correction would be quite reasonable, but odds are very good that correction will be bought. 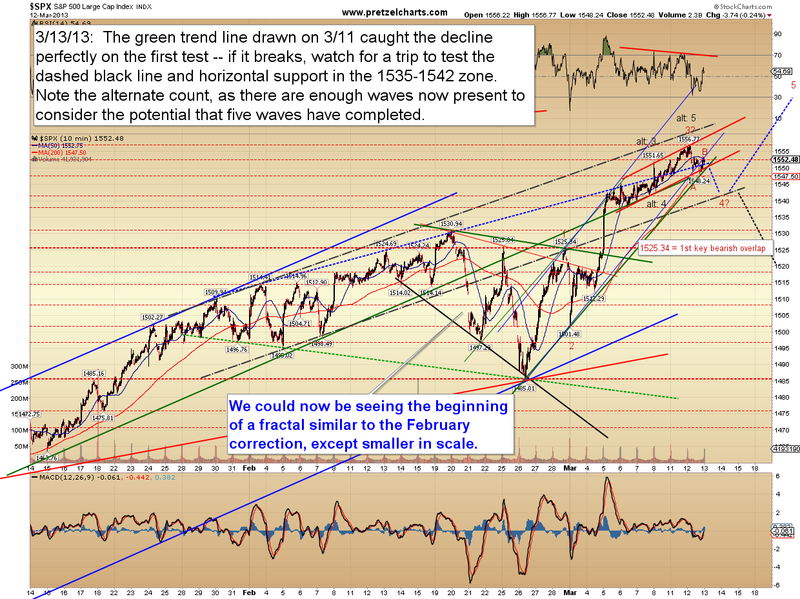 On the S&P 500 (SPX) chart which follows, I'll outline some of the next key levels to watch. For the near-term, I'm watching a couple favored possibilities. 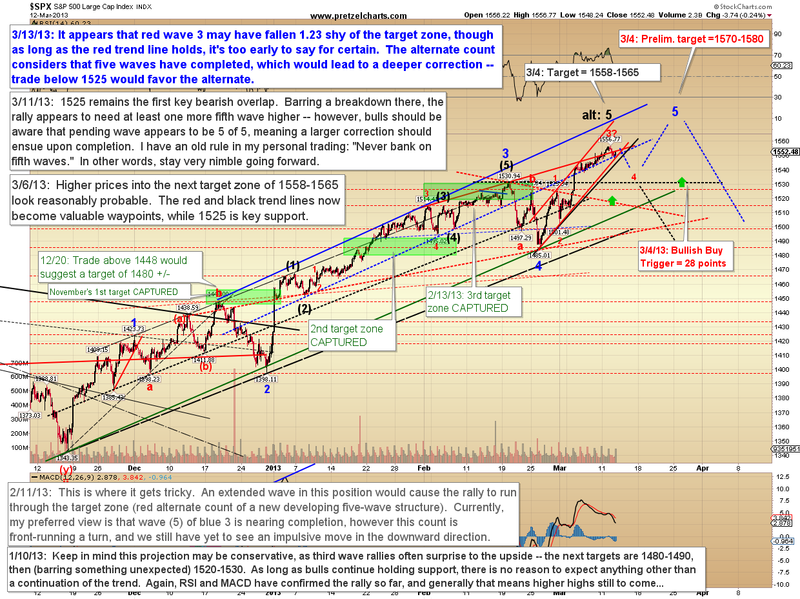 My interpretation is that yesterday's decline was impulsive, which leads me to believe the market is now in a corrective wave. Presently, I'm inclined to believe this won't be a huge correction, and that new highs will follow -- however, there are now enough waves visible that we have to at least consider the possibility that this structure is already a completed five-wave form (black alternate count below). 1525 is the first important bearish overlap level, so there's about 10 points of no-man's land, wherein the market's intentions would be vague. That no-man's land lies south of 1535, which is the lower edge of the probable target zone, and reaches down to 1525, which is where we'll begin suspecting an even deeper correction is underway. 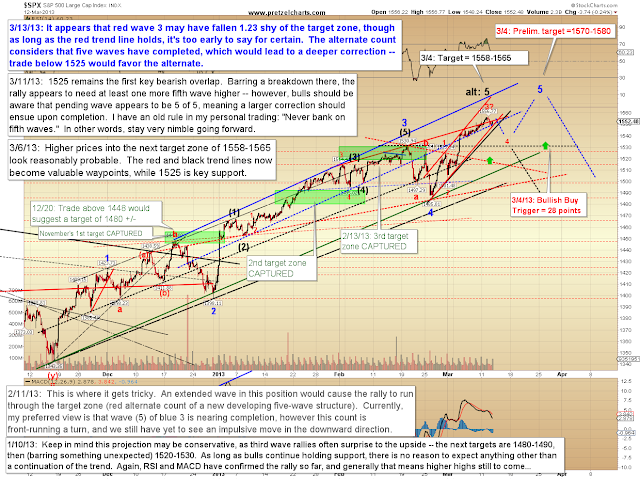 Conversely, sustained trade above 1557 would suggest that red wave 3 is still unfolding. The hourly chart notes that red 3 may have come up a little short of the target zone -- though if looked at from a bullish devil's advocate perspective, there is really nothing for bulls to get too concerned about until the red trend line breaks. Please continue to keep the caveat of March 11 in mind, especially since there may be five waves completing at multiple wave degrees. In conclusion, although past performance is no guarantee of future results (of course), history does tell us that a ninth consecutive advance for today's session is highly unlikely, and the wave structure seems to support the idea that a correction is unfolding. Presently, the preferred view is that this is a small degree fourth wave correction, but the potential does exist that five waves have completed at multiple degrees. This means the market is now in a zone where the risk for longs is increasing. Trade safe. Reprinted by permission, Copyright 2013, Minyanville Media Inc. 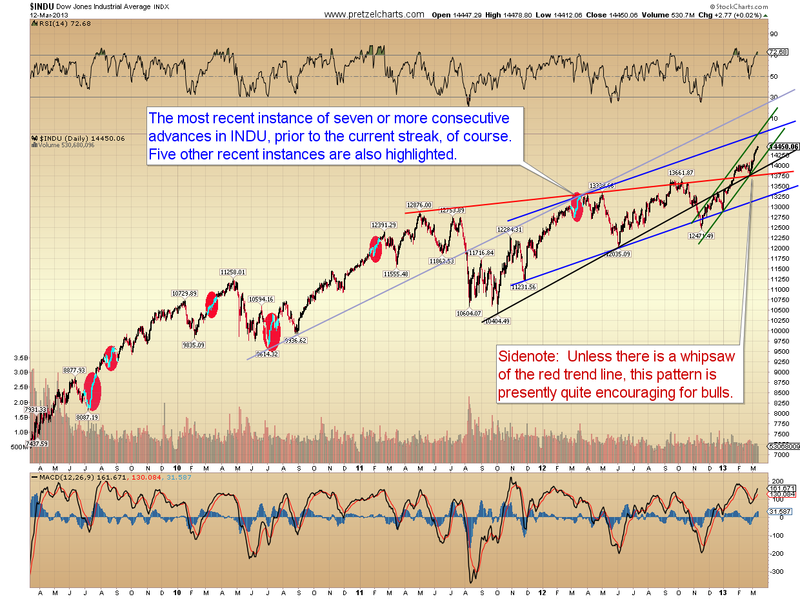 Seems that many are anticipating a market correction (for a while now). Perhaps the Ides of March will help it materialize!